Where did Amelia Earhart land? Who found her? Amelia was known as an aviation pioneer and author. She was the first solo woman pilot who flew across the Atlantic Ocean. Amelia Earhart disappeared in the route of the Pacific Ocean. She is my hero because she showed bravery because she flew across the Atlantic. She shows that girls can do anything. Amelia wasn’t always a pioneer her whole life and of course she had a childhood. 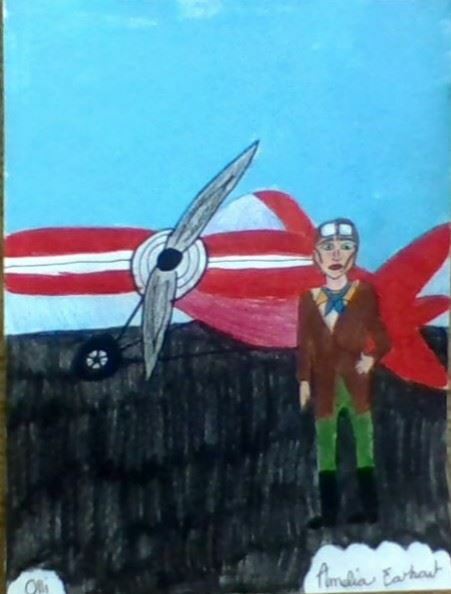 At age 10 Amelia was at a state fair and was not impressed with the planes. She thought they were rusty and old looking. She said, “It was a thing of rusty wire and wood and looked not at all interesting.” Almost a decade later Amelia visited a stunt flying exhibit. The plane was getting ready to take off and as it dove above her she thought that it almost said something to her. On December, 28 1920 she finally got to ride in an airplane and that's when things changed. As Amelia set her journey she ran into some great accomplishments. She became the first woman to set the women's record of 14,000 feet in the air. People expected none of less out of women so that was a big accomplishment for her. Amelia didn´t just set that record she also set the speed record of 100 kilograms with no load. Now as she thought it wouldn’t get better she was was working one day and answered the phone and said, “I am too busy to answer this right now.” The person on the phone said it was really serious. They asked, “Do you want to fly across the Atlantic Ocean?” Right away she said “Yes”. Later on she successfully flew solo across the Atlantic and became famous. Now it was Amelia’s last fly. It was around her 40th birthday and she wanted to fly around the world. Besides the attempt that she did that destroyed her plane in March. Her plane was rebuilt and was ready to fly. She and her partner flew to a island called Lae, New Guinea. Their next hop was a tough one. They had emptied all their supplies just for more fuel. With extra fuel they flew off. No one really knows what happened to Amelia, but it will forever be a mystery. In conclusion, Amelia is my hero because she set high expectations for women and made the world think about how we can do stuff too. And as Amelia said, “Anticipation, I suppose, sometimes exceeds realization.” To me this quote shows how important it is to have dreams.